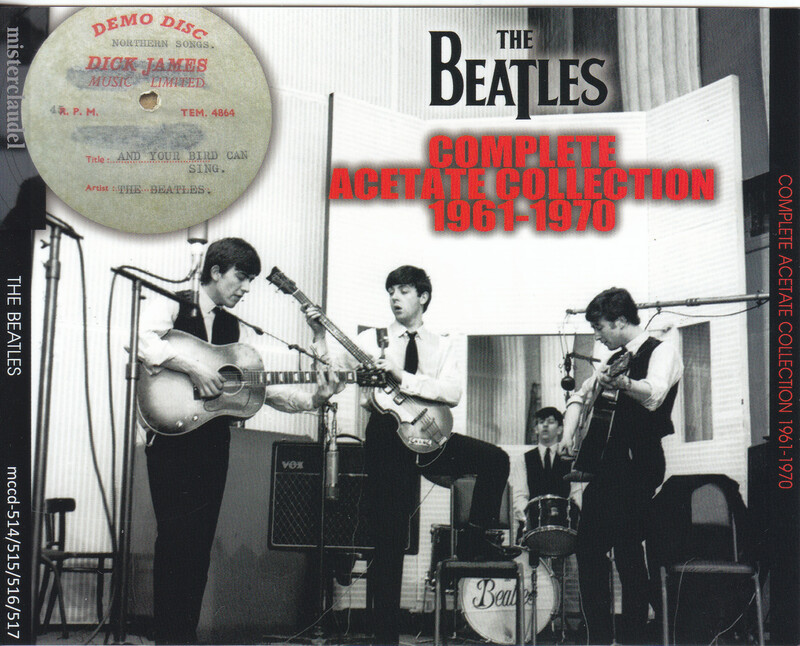 first appearance acetate sound source number included! ! 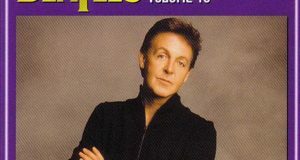 ■ another version of the first appearance and “And Your Bird Can Sing,” “Taxman”! ■ first appearance middle part and the ending part is different from “Tomorrow Never Knows”! ■ AB both sides acetate sound source of the first appearance “Mary Jane”! 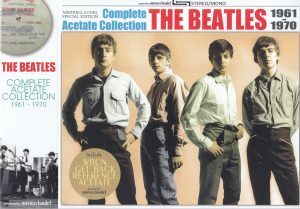 Than mania must-have M Claudel label, including the first appearance sound source, the title was the culmination acetate sound of the Beatles will be released. Until now, but there are many titles that was recorded acetate sound source, either not content and completely, and also those passing through or sound quality to many generations, did not have a title that go quite satisfactory. This work, it is the culmination of such acetate sound source, it will be delivered as the best collection both in terms of content quality manner also. Features of this work, it is of course that you are the culmination acetate sound source is located in the point that it includes a large number anywhere first appearance take that could not be the thing to listen even until now. 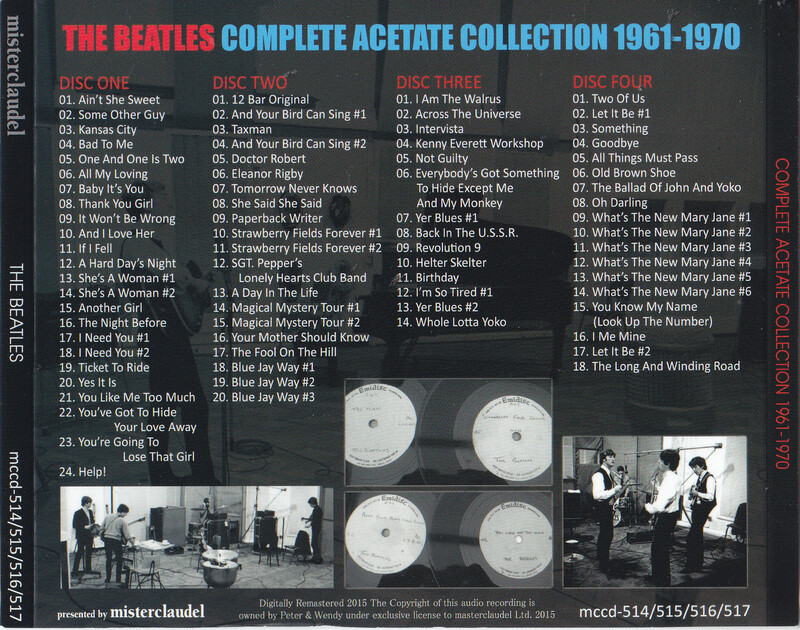 There is no doubt that this work is the contents of a stir in the study of Beatles recordings. Of course, it is a sound source from acetate, the thing most of them are those of half a century ago, on the property that above all acetate, but there is also a track that stands out is Hari-on, as much as possible so as not to detract from the vividness of the original sound, needle such as processing to reduce the sound is not done at all, it has been recorded as it sounds exactly reproduced. 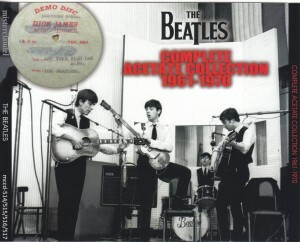 Disc 1 has recorded acetate sound source made in time from the previous debut to “Help”. 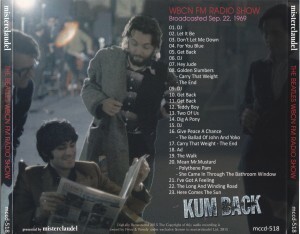 It began was recorded before debut “Is not She Sweet” and “Some Other Guy”, was recorded in the calibration burn club “Kansas City” is the version that recently excavated the comments do not suffer. 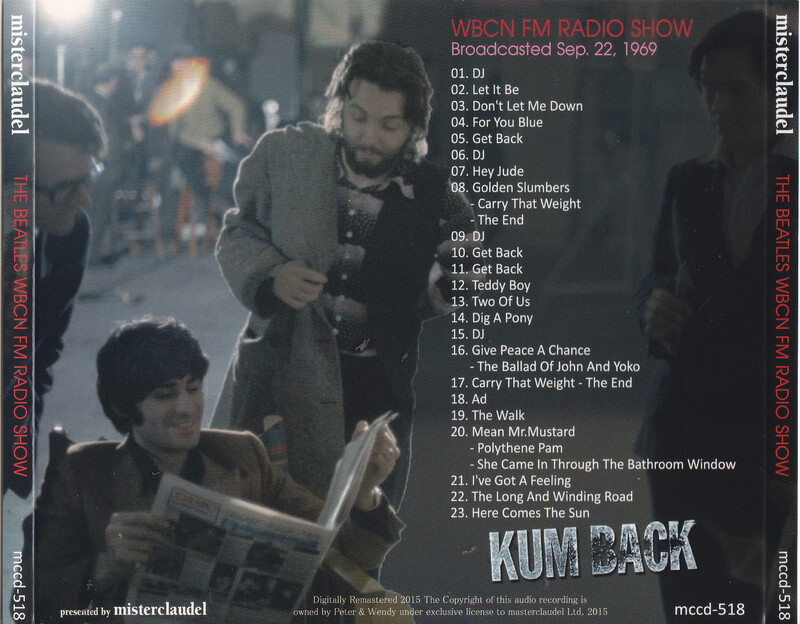 “Bad To Me” in the unpublished version of two songs was not funny also been recorded in the anthology of “One And One Is Two”, it is something familiar, here it has been recorded in the best state. 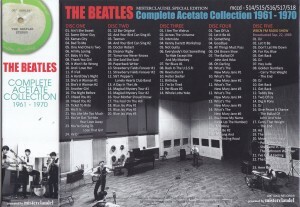 And attention is the four songs of “All My Loving,” “Baby It’s You,” “Thank You Girl,” “It Will not Be Wrong.” Take itself is the same as the release version, but acetate sound source first appearance. In track vivid texture of acetate unique comes through in direct, one far from listening of this work. Other “A Hard Days Night” film production mix of the “Help” is also perfectly recorded. Pi pi pi Pooh! It is. Disc 2 has become the most complete content of this work. This time, it is this work a maximum of eyeball, full debut sound source has been recorded. And met with first appearance sound of little “Revolver” times of outtakes, it is a sound source of surprise dance chest after a long time for mania. First “And Your Bird Can Sing # 1”, the guitar in a different take, also unedited ending. 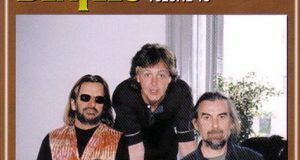 I met only became a dead issue, it is first appearance sound source can be seen as clearly differences also point that George misses the guitar. In addition, “Taxman” also, ending those that vary from the release-take, has been subjected to editing, such as patchwork eerie tape, is the first appearance take that it is possible to listen here for the first time. 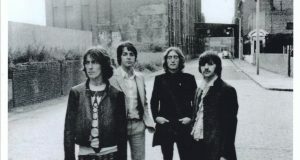 The “Tomorrow Never Knows” is also different, and it has been recorded long. Others, also four songs of “Doctor Robert,” “Eleanor Rigby,” “She Said She Said”, in the first appearance of the sound source as acetate sound source, the release version, except texture of acetate unique fresh sound in and listen to one impression difference I think not, but there may be minor differences Maybe. There is I think if you can go to clarify in future studies of everyone. Other “Rubber Soul” from the “Magical Mystery Tour” is recorded acetate that has been created in the period of up to. Barrett tape and Scott tape is compared to the initial center, acetate is the charm of the medium-term in many cases. 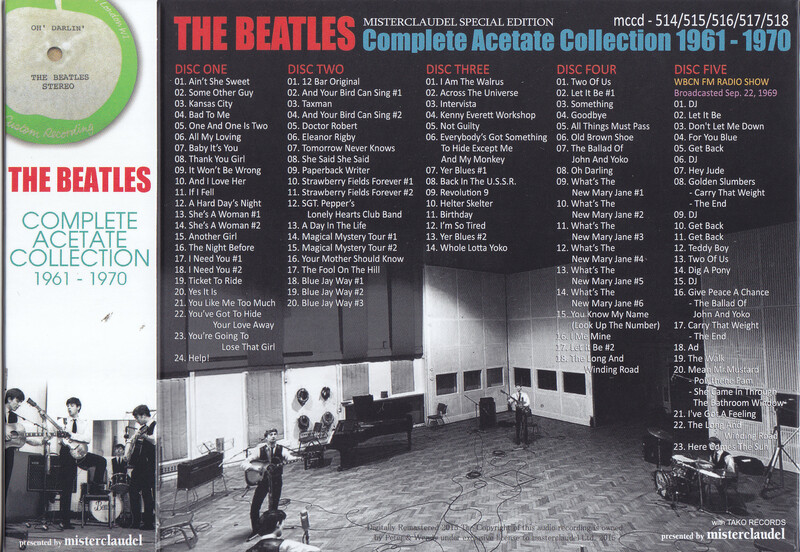 Disk 3 has recorded the time of acetate from the “Magical Mystery Tour” to “White Album”. It is paid without Kenny Everrett related acetate also miss. In addition to the acetate of the familiar “White Album”, also recorded acetate of playing Rock’n Roll Circus of Dirty Mac. It is a place interesting and have been made even such a thing. 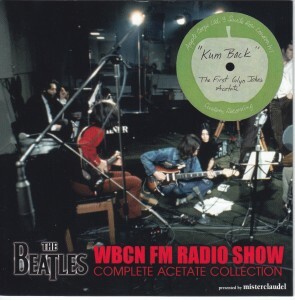 Disk 4 “Get Back / Let It Be,” “Abbey Road,” “Mary Jane”, other, recorded acetate until dissolution just before time. Click here for the first appearance sound source is one of the highlights of this work also, we have recorded the sound source was recorded performance of 7 minutes of “What’s The New Mary Jane” to AB both sides. Acetate when it comes to this area also stereo sound source will continue to increase. And finally, disk 5, the broadcasting of WBCN which is said to have become the original Beatles’s first bootlegs “Kum Back”, as well as part of the Beatles, announcement or middle of the CM of the broadcast station, and such songs of other artists The including, it recorded as it is. Terms of content and in those famous, here also is something that has been recorded in a number of title until now, however, one place only, there is a different place and those that have been released so far. Become a now is the eternal mystery of the Beetle mania, but I would like you to please clarify with you.